Next week’s T-Mobile Tuesday continues with T-Mo’s theme of offering Halloween gifts in October and includes a few other goodies, too. For the T-Mobile Tuesday on October 17th, T-Mobile customers can get 60 percent off at Joaan stores for crafting goods and decorations, including stuff for Halloween. 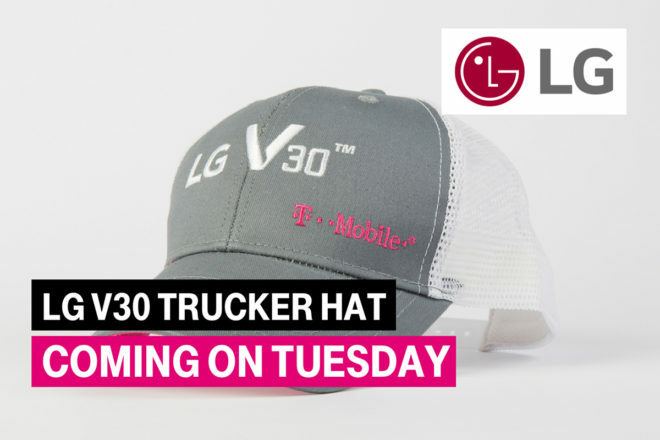 Also available next week is a trucker hat with LG V30 and T-Mobile logos. Rounding out next week’s gifts is a free 1-day movie or game rental from Redbox, a $2 Dunkin’ Donuts card, and $10 off plus free shipping at Guess. The prizes for next week’s T-Mobile Tuesday include a 65-inch 4K OLED TV plus LG V30 package, an LG G6, and an LG MiniBeam Projector. Keep that $2 DD perk coming! Yea I love the $2 dunkin. It adds up over time. You beat me to it. Steadymobb asked who would wear it, I suggested a Halloween costume. You can bet it’s my plan. I’m sorry but that’s a dumb costume – I just don’t get what you’d be…An LG/TMO spokesperson? Good thing it’s $10 off and free shipping. The shipping killed the MLB offer. I love the dunkin! Load that on the app and get $12 of free coffee each time. Hate the Twitter spam to win big prizes though. Not fun. Wasn’t going to win anyhow but definitely not participating in the spambot effort. Has anyone on here ever won the grand prize? I’m starting to feel like no one ever wins the top gift. Well over 60 million users and a board with about 200 active users doesn’t have a grand prize winner? Must be a conspiracy. An LG/T-Mobile Spokesman. An idiot in a pink cape? Super Trucker? The possibilities are endless. I wear caps to work to keep from having to comb my hair. Honestly i couldnt care less whats on the cap. It could be red and say “make america great again” and if it was free id wear it. I dont wear caps for style and aside from douches, i dont think anyone else does either…. lol what? I think a LOT of people wear hats that try to fit their style (including me)…that doesn’t make me a douche. Just as wearing whatever you can find doesn’t necessarily make you a slob. Keep the Dunkin Donuts $2 promo going! That Dunkin is the best thing smoking. My wife loves ice cream, and they work at Baskin Robbins! So Popular Mechanics is sold out already or something?